How can the sensory environment of heritage sites bring us closer to a historical evocation of the past? Is the fixity of heritage, especially the preservation of architectural heritage, a problem, and can artistic methods help us to think critically and differently about heritage? In cultural terms, what is cleaning and what does it do? Cleaning Up After Gropius is an ongoing piece of work. A first installation was developed in June 2014, which demonstrated the concept. A second iteration is in process, and is due to be installed in June 2015. In the Spring of 2014, the Bauhaus Dessau re-opened the site of the famous Meisterhäuser in Dessau. The Meisterhäuser are a UNESCO Global Heritage Site, comprising some of the houses which were built by Walter Gropius and his Bauhaus colleagues in the 1920s, were lived in by them, and were used to demonstrate modernist conceptions of a new, designed lifestyle for the contemporary age. As such, these are icons of the very first vision of modernism, the design movement in whose historical shadow contemporary design still lives. The Meisterhäuser are considered of immense significance for global design and heritage, and politically for Germany and for the state of Sachsen Anhalt. The Bauhaus Foundation in Dessau is holding an international exhibition in 2015 which will think through some of the problems of the contemporary household and contemporary design, particularly in the wake of the modernist legacy. 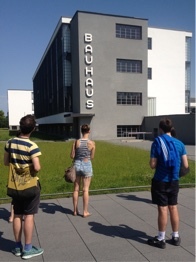 With this in mind, the Bauhaus held a Summer workshop in 2014, at which postgraduate groups from three Universities developed installations to think critically about modern households. Six anthropologists spent the Spring researching and thinking critically about modernism, heritage and the Bauhaus specifically, and developed three possible avenues to explore. The group decided to look at cleaning practices. Cleaning is routinised, rhythmic, and very mundane. When it comes to buildings, and particularly public ones, it is collectively organised by teams of people, and has a very social element. The act of cleaning is also, in some instances, an act of preservation, by which buildings and things are maintained in a certain kind of state. Cleaning comes to be a significant act aimed to prevent change, prevent decay, and hold heritage forms in a state of stasis. For some months, the group worked on different installation possibilities. Some researched modernism in a literary sense, others cleaning. Others interviewed cleaners, and collected audio samples from cleaning work. Recording was done in selected environments, and in a participatory framework, as cleaning was happening, rather than as an interview. Acoustically, the audio samples collected were made as ‘situated’ as possible using binaural microphones and recording. 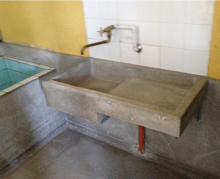 Left: Original concrete sinks in one of the Bauhaus Foundation’s houses, on the Törten Estate. Right: a still from a 1920s Bauhaus film ‘Neues Wohnen (Haus Gropius)’, by Richard Paulick, in which a maid demonstrates the mopping of a floor in ‘modernist’ style. In Dessau, sounds were installed in one of the Meisterhäuser, in the large, echoey concrete upstairs rooms. The doors were closed, such that the sounds emerging from behind them were the signs of cleaning going on. Downstairs, in the cellar space, alongside of various cleaning paraphernalia and objects, interviews were played with cleaners, which detailed the technical requirements and specifications of the cleaning work at the Bauhaus. The interviews acted in one way to ‘demystefy’ the acts of cleaning, specifying chemicals, amounts, and physical activities required, and how they were organised and conducted. At the same time, the quantity of specialist cleaning information and expertise, and what was required for these specific surfaces, room sizes and materials, was striking; such that the interviews were in themselves a technically “enchanting” device. The installation as a whole attempted to oscillate between acts of enchanting imagination, of demystification, and of re-enchantment. Left: A piece of “found art” is installed into the piece. 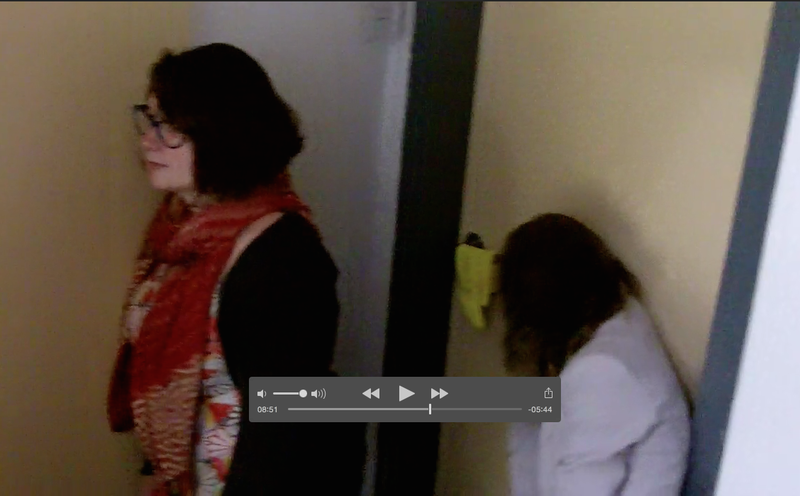 Right: Architecture students listen to the sounds of cleaning at the opening of the installation (still image from a video of the work). Importantly, cleaning here creates a sense of heritage, because it creates a sense of which elements in life receive special attention, are elevated above the status of the everyday, by means of a set of practices so mundane that they are often actively hidden from view. 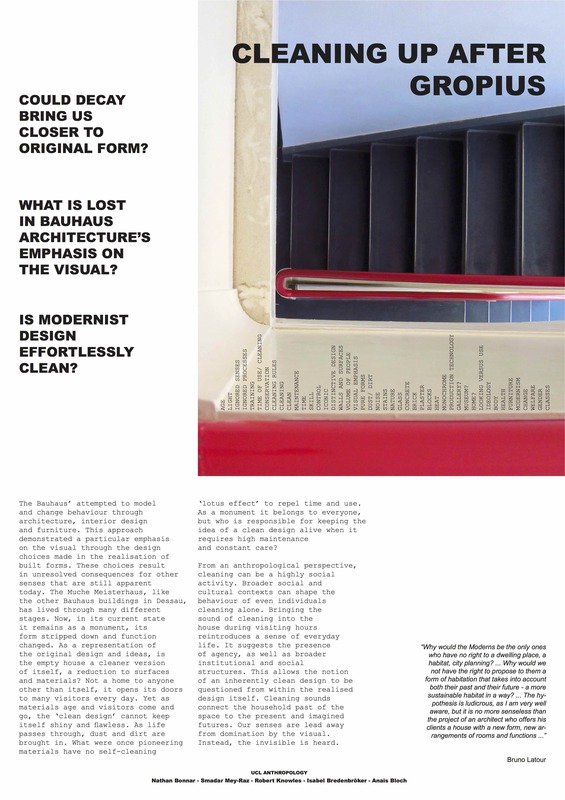 Cleaning is especially important in the Bauhaus, because of the importance of the surfaces and forms, not only in being a lived-in and used space, but for communicating a concept, and constantly and ubiquitously evidencing a conceptual side of life. The opportunity for a group from UCL to work within the Bauhaus Meisterhäuser themselves was a fantastic opportunity for us. While the Meisterhäuser are in one way just concrete forms, the sensory experience of working in them – the scents, echoing acoustics, and patterns of light are quite extraordinary.